Since 2008, Elaine Landau's The Louisiana Purchase: Would You Close the Deal? has been one of the most adored social studies titles released by Enslow Publishers. Landau's book, written for students in grades 3-4, teaches the Louisiana Purchase through a series of segments in which a historical situation is explained and the reader must decide on a course of action. Primary sources and illustrations are a constant throughout the book. A Musical Journey in the Footsteps of Lewis & Clark, created by our own president, Mark Enslow, with his wife, Anne Enslow, and a band of talented musicians, is a unique musical history of the Lewis & Clark expedition. The album contains a mix of narration and performances of historical songs from Lewis & Clark's era. Making these two resources available to students learning about the Louisiana Purchase and the Lewis & Clark expedition is a great way to give them a deeper understanding of the overall time period while providing the materials needed to create great reports. Check out Enslow.com for these and other great non-fiction titles! The year-end holidays present a wonderful opportunity for young readers to enjoy shared reading experiences. Whether children experience read-alouds at a library, or sit with relatives and follow the text, the common denominator is that kids are reading and enjoying it. Books about year-end celebrations offer the immediacy and holiday excitement with which kids most easily connect and in which they stay interested. Enslow Publishers provides engaging holiday books suitable for young readers. Books such as What is Thanksgiving? and What is Christmas? provide a fun, enriching look at these festive days. Author Elaine Landau's on-target, Guided Reading Level "G" text, along with bright, full-color photos, provide the full flavor of the holidays to young readers. Each title in the seven book "I Like Holidays!" series is available in a library-bound edition for $15.95, a 25% school/library discount from Enslow's list price. The books are also available in paperback for $6.95 per title. Elaine Landau has written a new elementary series of holiday books for Enslow. What Is the 4th of July? 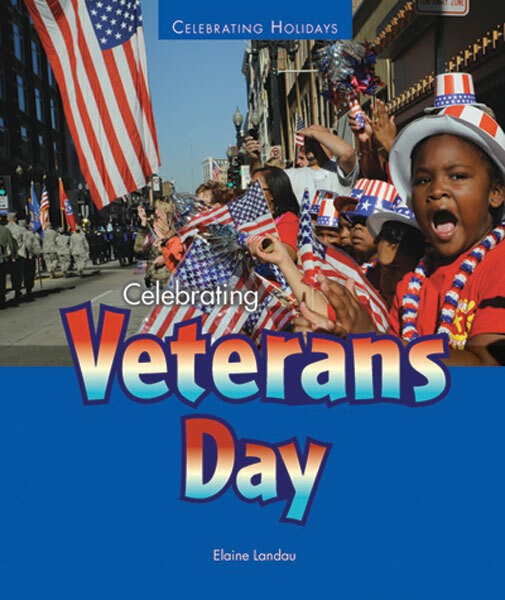 describes the traditions and symbols of this holiday, as well as includes a hands-on activity. This title (as well as the rest of the titles in the series) is available in both library and paperback bindings. Other titles in the I Like Holidays! series include Christmas, Halloween, St. Patrick's Day, Thanksgiving, Valentine's Day, and Veterans Day. All of these titles will be available soon. February is the month our nation celebrates the birthdays of two presidents: Abraham Lincoln and George Washington. Both iconic leaders loom large in schools' American history curricula. For teachers, one challenge has been to place these figures in context without trivializing their significance or overwhelming students with unmanageable detail. Books from Enslow's intriguing American history series "What Would You Do?" provides solution for that pedagogical dilemma. Author Elaine Landau's six-title series is structured to foster a variety of teaching needs, including small group exploration, whole group activity, or individual work. Each book's 48-page length, excellent illustrations, and Guided Reading Level "O" content helps create the conditions for a successful reading experience. Landau also combines speculative opportunities for students within her narrative to encourage critical thinking development. Free, downloadable teacher's guides, which includes activities in all curricular areas, are available for all books in this series. The Emancipation Proclamation: Would You Do What Lincoln Did? drives readers to consider the Union's situation and Lincoln's options as he considered this freedom-giving declaration. George Washington Crosses the Delaware: Would You Risk the Revolution? presents the historical moment and decisions Washington faced to maintain the struggle for American independence. Both books are available in paperback from Enslow Classroom for $7.95 per title. Library-bound editions for these titles are also available. Labels: classroom, elaine landau, Enslow Classroom, George Washington Crosses the Delaware, The Emancipation Proclamation, What Would You Do? Snowy Owls: Hunters of the Snow and Ice, written by Elaine Landau, has been published. How do snowy owls live in the cold Arctic? What do they hunt, and how do they raise their chicks? What are people doing to help save them? Learn about these rare and special animals, including facts about their life cycle, diet, and other unique features that help them survive in the snow and ice. 32 pages, full-color photographs, Enslow Publishers, Inc.
Other titles in the series include: Beluga Whales, Emperor Penguins, Harp Seals, Polar Bears, Snow Leopards, and Snowy Owls. Polar Bears: Hunters of the Snow and Ice, written by Elaine Landau, has been published. Harp Seals: Animals of the Snow and Ice, written by Elaine Landau, has been published. How do harp seals survive the freezing snow and frigid waters of their natural habitat? How do they find food and raise their pups? What are people doing to help save them? Learn about these rare and special animals, including facts about their life cycle, diet, and other unique features that help them survive in the snow and ice. Emperor Penguins: Animals of the Snow and Ice, written by Elaine Landau, has been published. How do emperor penguins survive on the frigid Antarctic ice? How do they raise and protect their chicks? What are people doing to help save them? Learn about these rare and special animals, including facts about their life cycle, diet, and other unique features that help them survive the snow and ice. Beluga Whales: Animals of the Snow and Ice, written by Elaine Landau, has been published. Other titles in the series include: Emperor Penguins, Harp Seals, Polar Bears, Snow Leopards, and Snowy Owls. Snow Leopards: Hunters of the Snow and Ice, written by Elaine Landau, has been published. How do snow leopards survive in the snowy mountains? How do they find things to eat, and raise their cubs? What are people doing to help save them? Learn about these rare and special animals, including facts about their life cycle, diet, and other unique features that help them survive the snow and ice.